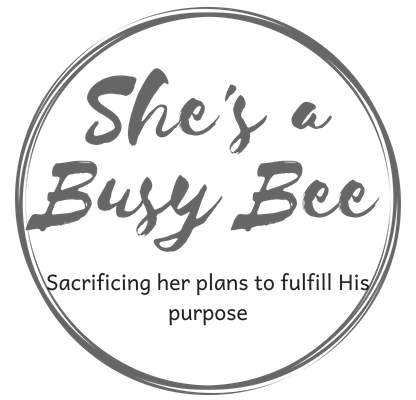 What is a Busy Bee? Welcome! I’m very excited you’re here! I am passionate about women experiencing Jesus’s perfect love and having a revelation of His truth. I don’t know where you are in this journey called life, but I hope my blog helps you find encouragement and truth to combat the lies and pressures of this world. As I share personal experiences and lessons I’ve learned, I ask that you too will share. Let us learn and grow together. Such a refresher and a blessing! From the moment I clicked on your blog, the first thought was..” Wow look at God’s Grace”.. Simply blown away!! I pray that God continues to fill you with Godly wisdom, knowledge and power.. To encourage everyone that clicks on your blog to read. May hearts be open to receive, and minds be changed to apply changes. I’m proud of you Sista from the church ☺ keep pressing, God has never made a mistake.. And He has already equipped you with all you’ll ever need! So proud of you to take a leap of Faith!!! Thank you for acknowledging and honoring all Busy Bees – it is needed and much appreciated! Continued Blessings, sistah! Amazing….May our Lord continue giving you wisdom on everything you do. Amazing….May our Lord continue giving you wisdom in everything you do. Unauthorized use and/or duplication of this material without express and written permission from this site’s author and/or owner is strictly prohibited. Excerpts and links may be used, provided that full and clear credit is given to She's a Busy Bee with appropriate and specific direction to the original content.